Arsenal manager Unai Emery has reportedly made seven major changes at the club since replacing Arsene Wenger in the summer. It’s been a strong start by the Spanish tactician at the Emirates Stadium, with the Gunners currently on a nine-game winning run in all competitions after thrashing Fulham 5-1 at the weekend. 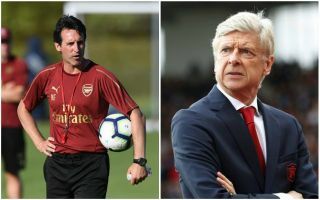 While it’s still too early to tell if Emery will be a success at Arsenal, the early signs are positive, with the Telegraph highlighting in great detail a number of different methods the former PSG and Sevilla boss is using in comparison to Wenger. Next, the Telegraph details Emery’s willingness to try different formations, having seemingly switched between three already this season, the same as Wenger used throughout his entire 22 years in north London. The 46-year-old has even been ready to majorly tinker his tactics in this way with a change in formation during matches, something that seems very unlike Wenger, who was dedicated to his philosophy and didn’t like to overthink things tactically. The piece references a surprise lack of knowledge from Wenger about their opponents Ostersunds last season, which just shows how much the Frenchman looked to have fallen behind trends in modern coaching. Stats from the Telegraph’s piece also show Arsenal are using more long balls under Emery, which will no doubt please fans who had grown tired of the predictable style of play under Wenger. While the club used to be so entertaining to watch when the veteran manager first joined, the style reverted to something somewhat more over-complicated by the end of his reign, with the team so often criticised for trying to walk the ball into the net. The piece goes on to mention player improvement under Emery’s intense coaching, with the likes of Iwobi and Hector Bellerin seeming to particularly feel the benefits after looking to have gone backwards in the last couple of years. Another thing that seems to be getting the best out of players is the new feeling that no one’s place is safe, with the Telegraph noting how Emery has asserted more authority than Wenger by not being afraid to drop big names or take them off early in games. The piece states things got a little out of hand with the likes of Alexis Sanchez and Mesut Ozil at times under Wenger due to the feeling that the Frenchman would never drop them, whereas this season big names like Aaron Ramsey have not been assured of places in the team, and Pierre-Emerick Aubameyang was dropped to the bench against Fulham, while summer signings like Bernd Leno and Lucas Torreira have had to wait for their chances in the first-team. And finally, onto Torreira, who is cited in the piece as being a crucial part of Emery’s side due to finally giving Arsenal the defensive midfield they’ve needed for so long. The Uruguay international is a hard worker with quality on the ball who offers great protection to the defence, and also allows Granit Xhaka to occupy more of a ball-playing role than previously, with his work rate and positioning not exactly the best aspect of his game. All of this should be extremely encouraging to Arsenal fans, even if many won’t want to get carried away just yet after so many false dawns over the last decade. Many will have still felt that the legendary Wenger could turn things around for them, but it wasn’t to be and it looks like the right change has finally come. Arsenal fans have had to sit and watch their team miss out on exciting managerial appointments like Jurgen Klopp, Mauricio Pochettino and Antonio Conte in recent times, but Emery looks very much in that modern mould of being a hands-on, demanding and meticulous head coach.